Instead of helping them, the unionists attack the striking workers. To brothers and sisters from trade unions, civil society and friends who are concerned about the labor situation in China:Honda Auto Parts Manufacturing Co., Ltd. located in Foshan City, Guangdong Province, has entered the 14th day of its strike. 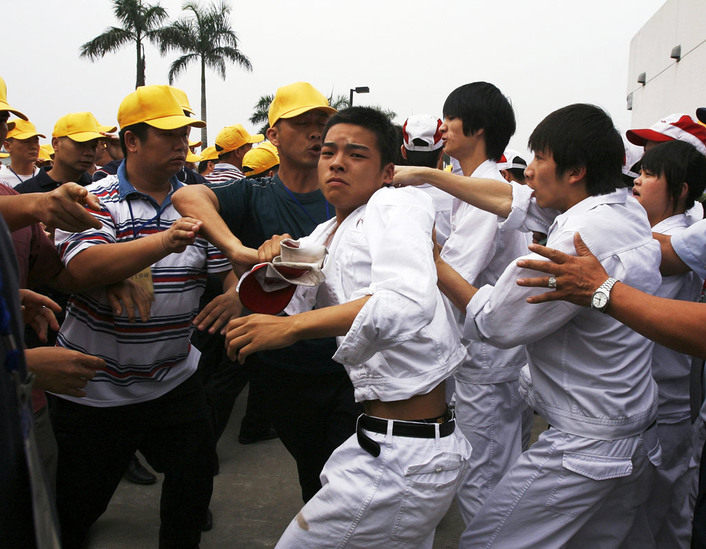 Of the many strikes by Chinese workers in recent years, this is one of the longest lasting. While many people are concerned and moved by the tragedy of Foxconn’s workers who have committed suicide by jumping from a building, the struggle of Honda workers undoubtedly is very encouraging. Honda workers told us that their struggle had got some success. From a total of more than 1,800 employees in the factory, 80 percent of them are student interns from technical schools. As they signed an internship contract, they are not protected by the labor law and their wages are as low as 900 Yuan per month. This is lower than the minimum wage level. Additionally they are not covered by any social insurance. When these interns were recruited in schools, the company promised free lodging and meals but only one meal is provided a day. After deducting the cost of utility bills, workers only have around 700 Yuan per month. Interns can become regular employees only after they have finished one year’s internship and obtained a diploma. Even when these interns become regular employees their wages are only 1,000 Yuan per month. On May 17, all workers went on strike and at the general assembly convened by their employers the workers made 108 demands and elected 30 representatives upon their employer’s request. However, the employer not only failed to show good faith in the negotiations, but also dismissed two worker representatives in an attempt scare the others. May 24, the company agreed to give a 55 Yuan a month meal allowance. This was sternly rejected by workers. The regular employees and the interns maintained a high degree of courage and solidarity and persisted with the strike. May 26, Honda management proposed a wage increase. This was different, however, for interns and regular workers. While interns would get a wage increase of 477 Yuan per month, regular staff would only receive an increase of 355 Yuan. All workers refused this differentiation formula. 1) A basic pay increase of 800 Yuan per month. Within three days of the wage increase, they would resign a labor contract. In addition the annual raise must not less than 15% and the year-end bonus and festival subsidies should not be less than the previous year. 2) Compensation for additional years of service subsidies--for each year of service there should be an increase of 100 Yuan per year with a 10-year cap. 3) Reinstate the dismissed employees and no punishment for workers who joined the strikes. 4) Re-organize the company’s trade union—Re-elect trade union chairman and the trade union related staff. May 28, Honda management again came up with a new proposal. 4) Re-organize the Honda company union. We call upon friends and allies who are concerned about the situation of Chinese workers to continue monitoring the developments of the incident and support the workers’ demands and actions when they are in need.